August Owlcrate arrived and this month’s theme was Mystery! I haven’t read a mystery book in so long so I was very excited to what surprises this box contained. Unfortunately, I think this month my hopes were a bit too high. The past few months have honestly been a bit on the fence for me with my Owlcrate. I have never been able to complain about one of the books – and the books are absolutely the best part of the box. This month’s book, “Trouble is a Friend of Mine” by Stephanie Tromly, has been on my To Buy list for months now, and obviously I was very excited to see it was the book chosen for this month’s mystery box. The button and bookmark included as author swag are, of course, box staples at this point and I’m so glad that they were included again. Here’s where things get iffy for me. I’m being completely honest with you guys at this point, so please bear with me. Owlcrate is not a cheap subscription for me. Each month, $36.98 is charged in order to continue my subscription to Owlcrate. I also receive multiple other subscription boxes, but Owlcrate is my most expensive on a monthly basis. At that price, (let’s average it to $18.99), that leaves another 17.99 (or another hardcover book) for goodies. Obviously, Owlcrate is buying their books in bulk so most likely, they aren’t paying retail price for them however. Same goes for their goodies – buying in bulk generally causes for some discounts on the purchase price for the buyer. What does all this mean for me? I understand there is of course, shipping costs and a profit margin that Owlcrate as a company aims to reach. But as a buyer, I expect to get at least $20 worth of goodies in my box each month to make it worth my while getting a subscription box – and I’m sure you’d all agree that the point in getting a subscription (besides the surprise of opening it each month) is also the “getting more for less” idea behind them. This month’s goodies included a set of 70+ Sherlock Holmes nail decals (adorable, please don’t mistake that), a Nancy Drew key-shaped keychain (which varied per box), and an art print with a beautiful quote from Harriet the Spy (again, lovely). These items were lovely and I am absolutely not complaining about the quality or choices. It is slightly disappointing for me to open my box and only have 1 physical item (the keychain) and the rest being on paper. This month, it felt as though I really didn’t get much for my money. That isn’t the main reason I subscribe to Owlcrate – I subscribe because it is always exciting to receive a surprise book in the mail each month. However, the goodies is what keeps people coming back – the book can be bought anywhere, at anytime. It’s the goodies that makes people fall in love with the box – for all the things they can’t get anywhere else. My disappointment does not come from the quality of the products chosen, it instead comes from the quantity. I’m not sure what these products ran Owlcrate to purchase and include in their boxes, but unfortunately, it felt almost as though we had been taken advantage of, and this month fell way off the mark for me and my love for this subscription box. This is the first month that Owlcrate has been a big let down for me – hoping that next month they redeem themselves with some beautiful goodies to compliment the book! 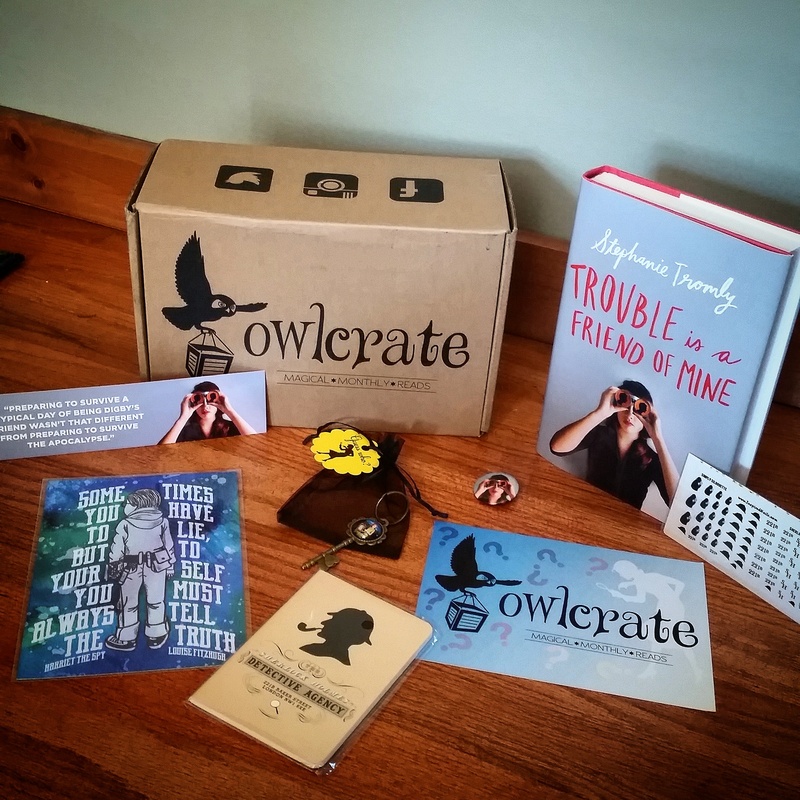 If you’re interested in receiving an Owlcrate, head on over to their website and sign up for the waiting list!